Polish Talmudist; born about 1635 at Gombin, in Russian Poland; died at Kalisz about 1683. He was a son of Ḥayyim ha-Levi, who was killed by the Cossacks in 1655. 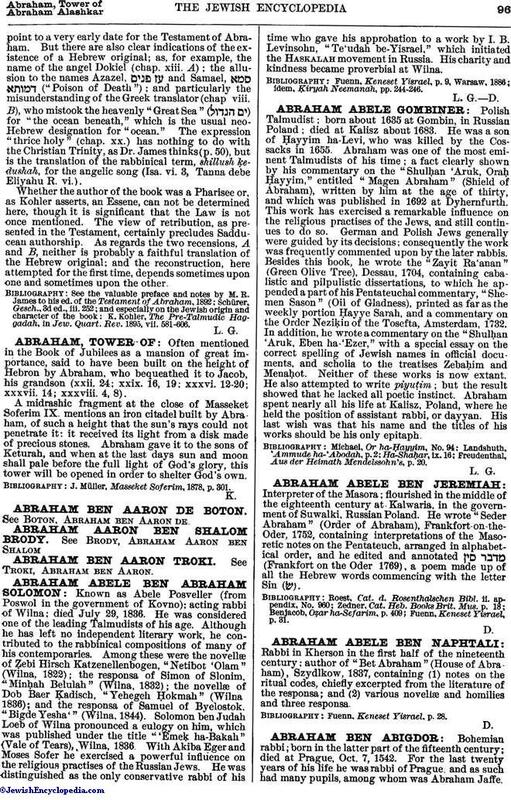 Abraham was one of the most eminent Talmudists of his time; a fact clearly shown by his commentary on the "Shulḥan 'Aruk, Oraḥ Ḥayyim," entitled "Magen Abraham" (Shield of Abraham), written by him at the age of thirty, and which was published in 1692 at Dyhernfurth. This work has exercised a remarkable influence on the religious practises of the Jews, and still continues to do so. German and Polish Jews generally were guided by its decisions; consequently the work was frequently commented upon by the later rabbis. Besides this book, he wrote the "Zayit Ra'anan" (Green Olive Tree), Dessau, 1704, containing cabalistic and pilpulistic dissertations, to which he appended a part of his Pentateuchal commentary, "Shemen Sason" (Oil of Gladness), printed as far as the weekly portion Ḥayye Sarah, and a commentary on the Order Neziḳin of the Tosefta, Amsterdam, 1732. In addition, he wrote a commentary on the "Shulḥan 'Aruk, Eben ha-'Ezer," with a special essay on the correct spelling of Jewish names in official documents, and scholia to the treatises Zebaḥim and Menaḥot. Neither of these works is now extant. He also attempted to write piyuṭim; but the result showed that he lacked all poetic instinct. Abraham spent nearly all his life at Kalisz, Poland, where he held the position of assistant rabbi, or dayyan. His last wish was that his name and the titles of his works should be his only epitaph. Freudenthal, Aus der Heimath Mendelssohn's, p. 20.